To all you reviewers who gave Super Mario Galaxy 2 perfect 10's: SHUT THE HELL UP. Seriously, it is not better than the first game. It is simply more of the same, with minor additions that are NOT improvements. They add new features to the gameplay but they don't IMPROVE the gameplay. The cloud & rock suits are cumbersome & not all that fun. Even Yoshi is not all that fun-- the speed peppers levels are awful. And the Bee Suit, which was the best suit from the first game, is back but it's penned in to a 2-D level design. In fact there's way more pseudo 2-D in this game and how can THAT be an improvement??? I'm starting to realize a fundamental flaw in platform gaming that has rarely been addressed in all the decades that the genre has been around: the "all or nothing" principle. Either you do it 100% or you can't do it at all. It may've been understandable to have games with that constrained of mission structure when the genre was invented in the '80's. But come ON already-- games have to evolve. A good example is Marble Saga Kororinpa. It gets mediocre review scores, and one of the main complaints is the difficulty traversing the levels. I disagree, but the real point is that Marble Saga Kororinpa does one thing that helps alleviate the difficulty & improves gameplay immensely-- in each stage you're trying to collect crystals, parts & bonus items. Say you get 75% through a stage, collecting a few crystals & die. You'll either restart at a checkpoint or the beginning.... but those crystals you've collected STAY in your collection, you don't have to get them again. This is a major thing because it's so annoying & endlessly frustrating to do nearly a perfect run, stick your neck out to collect that rare object tucked somewhere very hard to get at, but you do get it-- just to make one mistake & die.... then you have to somehow do that perfect run AGAIN. By taking that out of the equation, there's still challenge in Marble Saga Kororinpa because you still have to make it to the end of the stage. 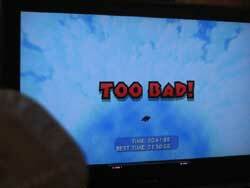 It just cuts down on the huge annoyance factor of games that demand perfect platforming every time. Super Mario Galaxy 2 is automatically a lesser game because it stubbornly sticks to a less advanced platforming philosophy of "all or nothing", and if you mess up 95% of the way through, you have to get all the 1-95% of what you collected back again. The only concession the devs make to sort of combat the all-or-nothing is to have a Cosmic Guide that plays the game for you. But again, that's an "all or nothing" philosophy: they're saying "Either you play it or we play it. Those are the only options." The clueless developers didn't actually fix the core problem. How about not having infinite respawning enemies every time you die? How about NOT including broken flying controls or stupidly impossible chasing bunnies levels? They weren't fun the first time, why would they be fun again?? Mario is so sluggish, when he gets hit he takes about 4 seconds to get up! Why even bother having it knock off 1 health when it takes him so freaking long to get back up that he gets knocked off walkways & cliffs anyway?? Super Mario Galaxy 2 should really be called Super Mario Leftovers because that's all the game is really.... levels that didn't make the cut the first tine around are dusted off & repackaged as a sequel. The game is not as polished as the first; once you accept some challenge modes it will restart the challenge infinite times until you either pass or run out of men, or pause the game & exit. Obviously programmers screwed up & forgot to offer a retry Y/N screen like in the first game. Just so many little missing things like this that make the game less than the previous. I feel awful to have exorbitantly overpaid for this game. In a perfect world, video game developers who rest on mediocrity & "tradition" should be punished with plummeting game sales, but the video game industry is far from a perfect world. While I wouldn't give it a perfect 10, I wouldn't give it the scathing (?) review you gave it. I'd probaly give it an 8. But yeah, SMG1was better than SMG2 at times. Otherwise, they're pretty even: they both have their own flaws and good parts. But hey, that's just me. I plan on replaying SMG 2. I was definitely harsh on it when I first played it... maybe on replay I may like it more. But there are a lot of games I'd like to replay when I have time. It's easier for me to replay handheld games because I have them on hand... it just works out better for me. There are a bunch of console games I'd like to go back into. Maybe in December.